Early February is an excellent time to cut back roses. Hybrid tea and granda flora roses in particularly should ne pruned around this time every year. Otherwise, roses become leggy, less vigorous, and unattractive. Unpruned ruses also won't bloom as well through the spring and fall months. Be sure to use a sharp bypass type hand pruner that makes a clean cut and minimizes damage to the stems. 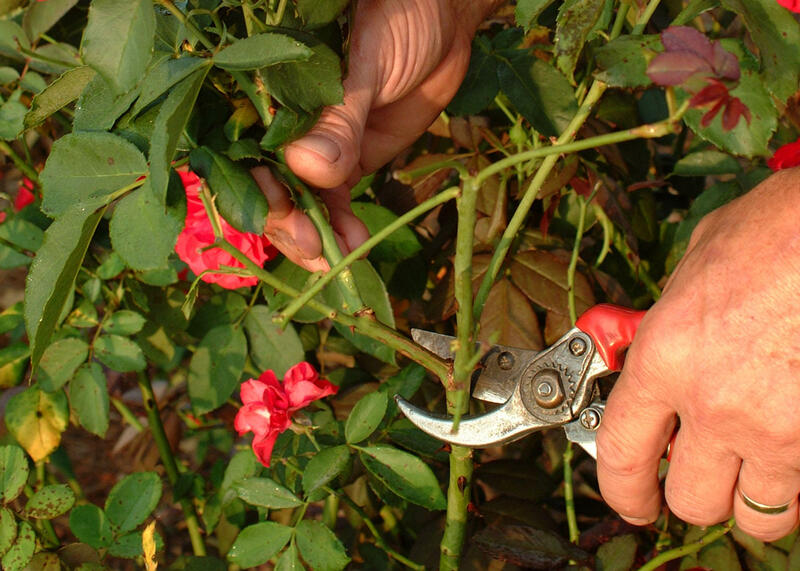 Early February is an excellent time to prune repeat flowering roses. And now is the time to get this done if you haven't pruned them already. Repeat flowering roses are those that bloom heavily in the spring and early summer, then intermittently through the summer, and heavy blooming again in October through early to mid December. Roses are pruned for a variety of reasons. One of them is to stimulate new growth. Another reason is to control the size of the bush. Fall is a great time to plant roses in the landscape. Virtually all trees in our landscapes will need to be pruned during their lives, particularly in the first two decades after planting. Sometimes a tree may be pruned in some way to help it, such as in dealing with storm damage, reducing limb weight, removing dead limbs, and stopping the spread of diseases. More often trees are pruned to adapt them to our urban environments, including keeping limbs from coming into contact with power lines, rubbing against the home, hanging too low, or obstructing views. Home gardeners can carry out minor pruning, especially to train younger trees before they get large. Ask yourself why you think the tree needs to be pruned. You might be wondering about your tropicals right about now. Tender tropical plants were significantly affected by this winter's cold temperatures. Sago palms took a beating this year and the AgCenter has been receiving a lot of questions about them. You want to prune off any fronds that have cold damage. The plant will be fine without them. The trunks have enough sugars in them to make sure the palm can leaf out this spring.